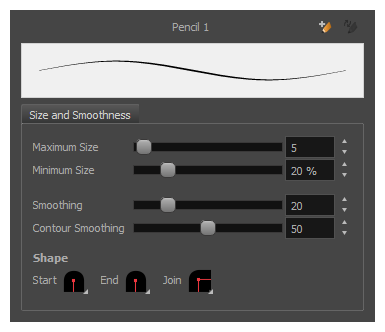 The Polyline tool allows you to draw complex lines or shapes by defining each point and their Bezier handles one by one. In the Tools toolbar, select the Polyline tool. NOTE For tasks related to this tool, see About the Polyline Tool. Storyboard Pro provides a variety of presets and also lets you create and save your own. It is a good idea to create and save pencils with precise sizes and parameters when you draw and design for efficiency and consistency. Allows you to rename the currently selected preset. Allows you to import brush presets exported from Storyboard Pro. Displays presets in a list, with their name and a preview of a stroke done with each preset. When this option is enabled, clicking close to a contour in your drawing will add the point to that contour. The line you are building will be linked to that contour. If this option is disabled, attempting to click on existing contours will always create a point very close to that contour, but not exactly on it. Therefore, it is necessary to enable this mode if you want to create lines that branch from into existing contours in your drawing. When enabled, drawing a closed shape will automatically fill it with the currently selected Paint colour. The Polyline tool draws the same type of line as the Pencil tool. 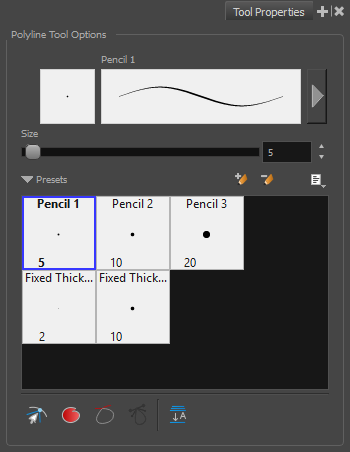 Hence, you can configure the Polyline tool's lines using the Pencil Properties dialog, which you can open by clicking on the arrow button right of the stroke display area in the Tool Properties view.